Table lamp of the Nidia collection for classic or modern rooms. Main metallic structure and conical fabric shade. Ideal for lighting bedrooms, dining rooms, halls...Dimensions: Height 40 cm. 20 cm.Lampshade dimensions: Height 13 cm. Width 9 cm. 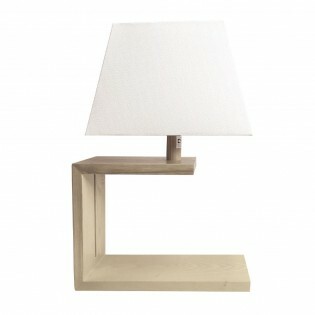 Table lamp from the Bergamo collection> . Made of metal, available in white or black finish. The screen has a PVC diffuser and is covered by fabric. It is ideal for use in bedrooms, living rooms and dining rooms. At the same time its modern style can illuminate spaces of certain businesses, offices and offices. Dimensions: Height 50-70 cm. Diameter 33 cm. 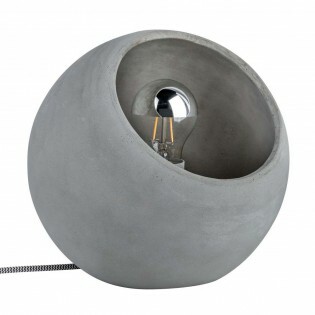 Table lamp from the Ingram collection made of concrete, spherical design and small lighting point inside. The light is projected upwards and produces an indirect light effect. An ideal element for living rooms, bedrooms or environments where you want to create cozy environments. Dimensions: Height 21.5 cm. Diameter 23 cm. Table lamp of the Carmen collection. It has a sleek, smooth lampshade made of grey fabric and a metal structure finished in silver with a glass element at the bottom. 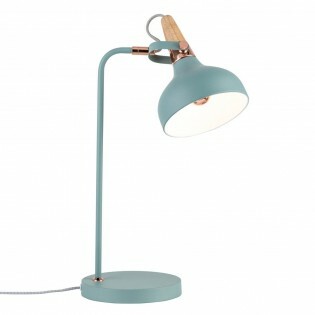 Ideal for lighting bedrooms, living rooms or dining rooms in a classic style. Dimensions: Heigth: 20 cm. Length: 30 cm. Width: 23 cm. Table lamp Brinus of a modern style, large sphere design and glass and metal construction with satin nickel finish. Very original and versatile, it will look great illuminating different rooms of your home: dining room, kitchen, living room, dining room etc.Dimensions: High 27 cm. Length 25 cm. Width 25 cm. Bedside table lampmodern retro style. 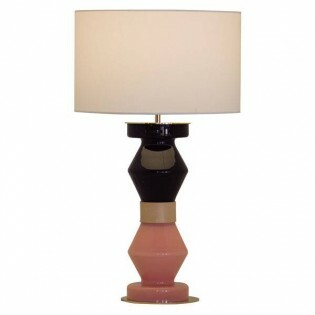 Pink and black lacquered glass base, metallic parts in shiny gold finish and detail in natural leather. With beige textile lampshade. Elegant lamp in living rooms, bedrooms, living rooms or hallways. Dimensions: Height 77 cm. Diameter base 18 cm. Lampshade diameter 40 cm. Table lamp Shine with LED technology integrated and possibility to regulate the light as you need. Made of aluminium and polycarbonate with a grey finish, it is perfect to place on the table in your bedroom or dining room.Dimensions: High 25 cm. Long 16 cm. Table lamp with modern style and elegent design. 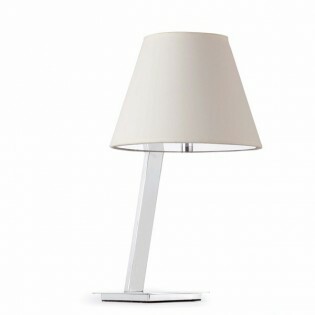 The structure of this lamp has a chrome finish and the lampshade is white. Perfect for lighting living rooms, bedrooms or hallways. Dimensions: High: 57 cm. Diameter: 30 cm. Lampshade height: 18 cm. 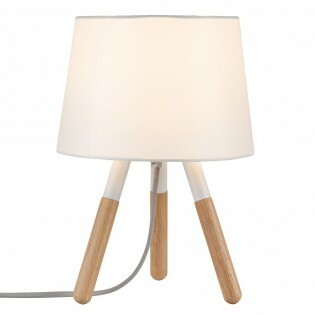 Modern style Indiana table lamp . 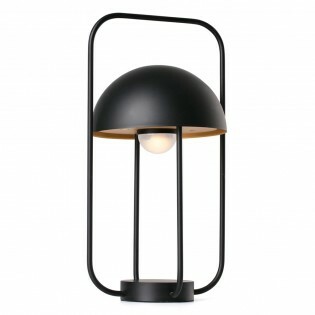 The lamp body is a metal lattice available in two colors. 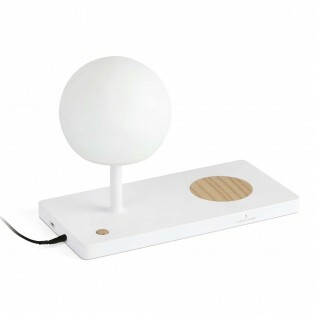 Opal glass diffuser with spherical shape and leather strap that give a different touch to this table lamp. Perfect for ilighting bedrooms, living rooms and dining rooms. Dimensions: Height 41 cm. (with handle) Diameter 18 cm. 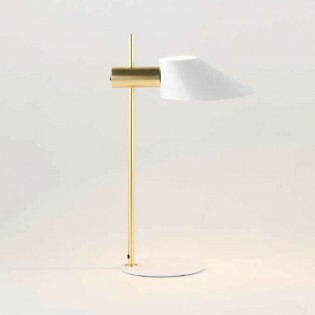 Table lamp from the Libal collection . The use of a tripod as a support gives it a decorative touch that combines perfectly with the focus. 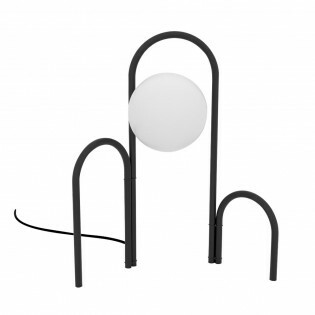 The structure is available in black finish with copper detail and white finish with nickel detail. Both screens have a white interior to improve light transmission. Dimensions: Height 53 cm. Length 24 cm. Width 24 cm. 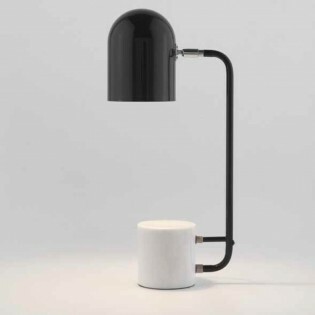 Endo it is a Table lamp in a modern style, with an avant-garde design. Made of metal finished in chrome color and lampshade round opal glass. The structure can be moved to adopt a completely vertical position or to turn the opal lampshade (see pictures), changing positions. Dimensions: Height 40 cm. Width 26 cm. Diameter base 20 cm. Table lamp with an S-shaped structure made of chromed metal and lampshade with transparent ice effect finish that will help create a warm and cozy lighting. 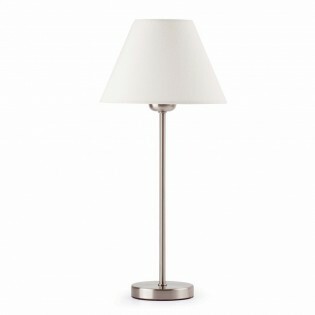 Ideal as auxiliary light in bedrooms or environmental in living rooms, dining rooms... Dimensions: Heigth 37 cm. Width 18 cm. Table lamp from the collection Luca with original Design by modern style. Its cylindrical base is made of white carved marble and the main structure is made of black metal. Perfect for bedrooms, living rooms, dining rooms...Dimensions: Height 6 cm. Diameter 1.3 cm. 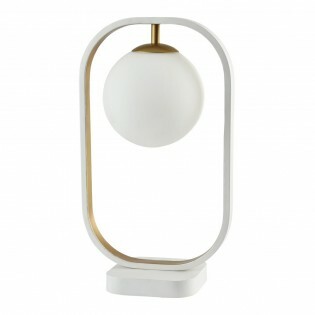 Stellan handmade Nordic style table lamp, in a design that inspires elegance and modernity. The fabric lampshade creates a magical light effect. The white colour predominates, making a perfect combination with its wooden base. Ideal for the living room, dining room or bedroom. Dimensions: Height 40 cm. Diameter 15.5 cm. Berka rustic table lamp with a certain modern touch. The conical lampshade is made of metal, available in gold, matt white or matt black and the base is made of beech wood. These two materials combine perfectly to create a perfect table lamp for your living room and bedroom. Dimensions: Height 44 cm. Length 17 cm. Width 25 cm. 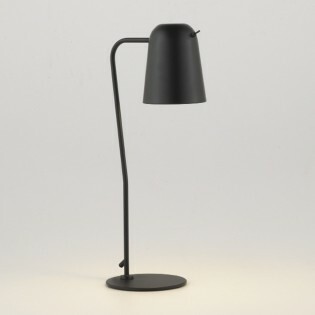 Berit table lamp. The whole set is handmade with a white fabric lampshade and three-sided structure made with exquisite taste, the touch of the wood is magnificent getting a modern design with a rustic air. A living room or dining room is a good place to put this beautiful lamp. Dimensions: Height 31.5 cm. Diameter 22 cm. Table lamp with bright colours, suitable for young people or with a casual touch. Satin green with a touch of copper. 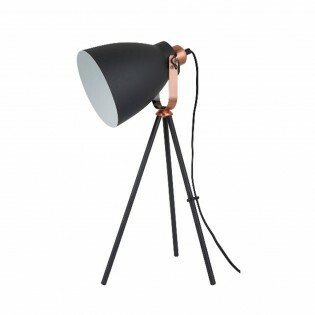 It can be used as a desk lamp in the bedroom or as a great decorative element in any room. Completely handmade design with metal fabrication. Dimensions: Height 51 cm. Diameter 25.5 cm. Width 18 cm. Table lamp of retro-vintage style, with a perfect combination of the structure in gold and its lampshade finishes in glossy white or black. The switch is at the same level as the lamp holder. Perfect for lighting modern living rooms or bedrooms. Dimensions: Height 55.2 cm. Diameter base 22.8 cm. Table lamp Énia made of aluminium, metal and methacrylate with chrome finish and acrylic diffuser. LED lighting built in of 8.1 W, neutral colour temperature. Driver included 110-240V 50/60HZ. A modern and minimalist design ideal to light up all kind of rooms. Dimensions: Height 41 cm. Lenght 13 cm. 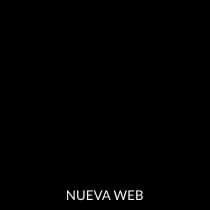 Width 12.5 cm. Bedside table lampmodern retro style. With lacquered glass base in different colours, metallic parts in shiny gold finish and detail in natural leather. With beige textile lampshade. 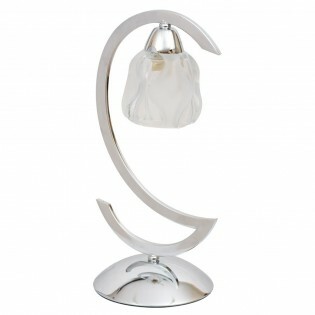 Elegant lamp in living rooms, bedrooms, living rooms or hallways. Dimensions: Height 86 cm. Diameter base 22 cm. Lampshade diameter 40 cm. Table lamp Dobi. Design by modern style made of metal, ideal for lighting tables in the bedroom, living room, dining room... with a circular lampshade that you can tilt as you need. Switch included.Available with matt white finish. Please consult us for more information.Dimensions: Height 47 cm. Diameter 15 cm. Table lamp with original design by Manel Lluscà, lampshade in metal with white or black and wood finish. Ideal for placement in living rooms, bedrooms and hotels decorated in modern style. Cozy effect of the light as it passes through the slits of the lampshade. Dimensions: High 43 cm. Diameter 20 cm. High lampshade: 17 cm. 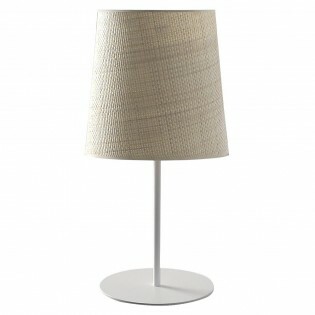 Table lamp made of wood with irregular design and fabric lampshade in raw white. The bottom and top of the base have different lengths. Ideal to illuminate with modernity rooms such as the bedroom, dining room or living room. Total dimensions: Height 51 cm. Lampshade dimensions: Length 20 cm. Width 35 cm. 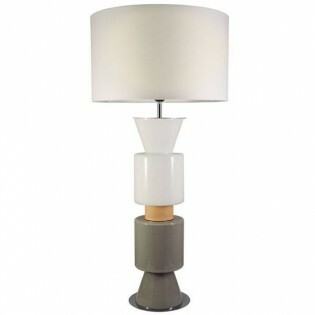 Table lamp from the Trento collection . The lampshade has a perforated detail that creates a unique lighting effect, letting light through the holes and the top and bottom. 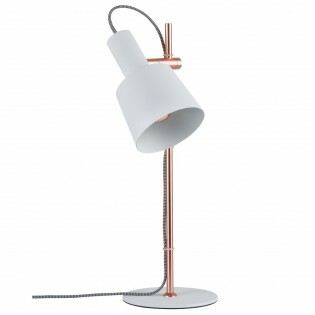 It is a table lamp perfect to be placed in bedrooms, it gives a modern and different touch. Dimensions: Height 55,5 cm. Length 17,5 cm. Width 26 cm. Table lamp Niko with a current, modern and functional style. Its rectangular base is made of white metal with wooden wireless charger and USB Port. White glass lampshade. Incorporates 6.6 W LED lighting adjustable in intensity adjustable by its switch. Ideal to create different ambiences in living rooms, bedrooms... Dimensions: Height 22 cm. Length 30 cm. Haldar table lamp with lampshade that can be configured in different positions. White and copper as main colours and short length textile cable in black. 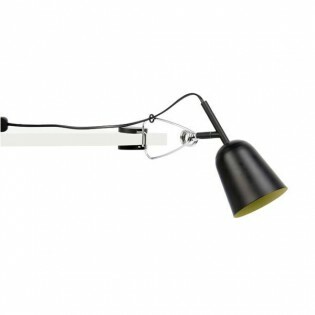 Ideal for illuminating the bedroom in the office or living/dining area as a decorative and ambient light. Dimensions: Height 46 cm. Diameter 16 cm. Table lamp Table with a modern and current design. Body of original design formed by pieces made in mirror effect metal. 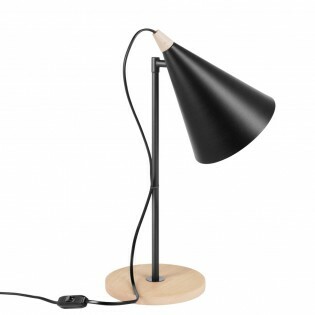 It combines perfectly with its black lampshade. Ideal to light bedrooms, dining rooms, living rooms...Dimensions: High 60 cm. Wide 32 cm. 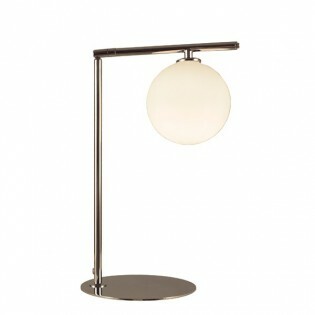 Table lamp Avola modern style with spherical white glass lampshade and handle structure. White and grey or white and gold finish. Ideal for use as an additional light on the bedside table or as a decorative element in dining rooms, living rooms... Dimensions:Height 39.5 cm. Length 23 cm. Width 25 cm. Table lamp Diamond with three Light Bulbs LED 6 W included. It has an opal glass diffuser, made of chromed metal and Lampshade with decorative Transparent glass coppens. To illuminate with classic style your hall, dining room, bedroom etc. Dimensions: High 52 cm. Diameter 33 cm. 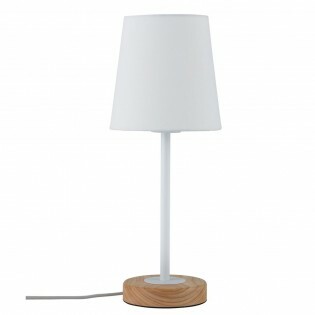 Table lamp for rustic rooms with round base and main part made of wood with slightly curved design. The distinctive touch is provided by the cable that runs through the structure to the lampshade. It is made of white fabric with a soft and cozy shade of light. Dimensions: Height 43 cm. Diameter 19 cm. Desktop functional and modern. textile conical lampshade in white or black and inclined linear base with chrome finish. Essential for its placement in rooms, reading areas, bedrooms, living rooms, hotels, etc.. Dimensions: High 44 cm. Length 34 cm. Width 23 cm. What is the style of your room? For what room of your home do you want your table lamp? At Wonderlamp.shop you will find table lamps for all styles: rustic, modern, classic, retro, vintage... at the same time as designer lamps for the most exquisite tastes. You can also buy a table lamp depending on the room of your house you want: lamps for the dining room, lamps for the bedroom, lamps for the living room, etc. 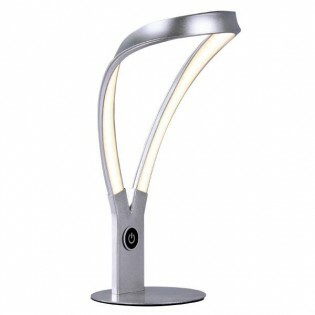 What we are sure of is that in Wonderlamp.shop you will not be dissatisfied. 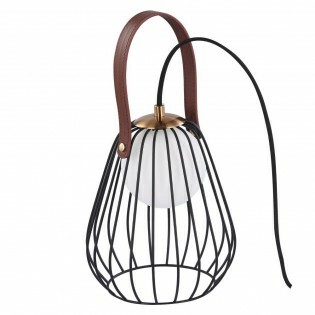 We have a large selection of lighting products and lamps for all tastes, styles and rooms. Also, if you are looking for lamps for your business or restaurant, we can offer you exclusive discounts so you can surprise your customers. With the right table lamp you can light up every corner of your home, creating different lighting environments and giving a decorative touch. At Wonderlamp.shop we are sure that you will find the ideal table lamp for any purpose you seek: lighting up your business, decorate your living room or give a cozy touch to your dining room. For all styles and decorations: modern, rustic table lamps, design for the dining room, living room or bedroom. LED technology offers maximum efficiency with minimum consumption. If you want to save on your next bills, find the perfect LED table lamp for you.